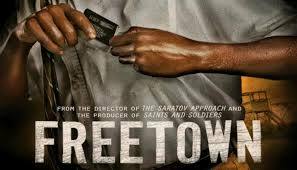 Brief Synopsis – A group of Liberian missionaries try to get across their war torn country and to safety relying on their wits and faith to make the grueling journey. My Take on it – This is a film about faith and perseverance when one is up against unbearable odds. This is based on a true story yet still requires us to believe that they make their miraculous quest solely based on their faith in a higher power leading them across a very dangerous war zone as they try to find freedom. This is an ensemble film and none of the characters really stand out among them all which I think is a good thing since we are meant to see them as a unit during their journey instead of individuals. Anyone who believe in some kind of higher power can easily understand what these men went through on their trek and they are constantly tested over and over along the way and must cling to their faith in hope for survival. The story feels average though and it’s definitely not a film that would appeal to everyone. Bottom Line – Interesting idea that relies solely on the faith of the viewers to believe that this really happened because of all of the “miraculous” occurrences during their journey. None of the characters really stands out among the rest which is good because we want to be able to see them as a unit instead of individuals making this quest.